Nerd Alert. At a Bitcoin convention with 3D printed name tags. It doesn’t get any better than this. Mister P and I got hitched back in January, but never had a honeymoon. 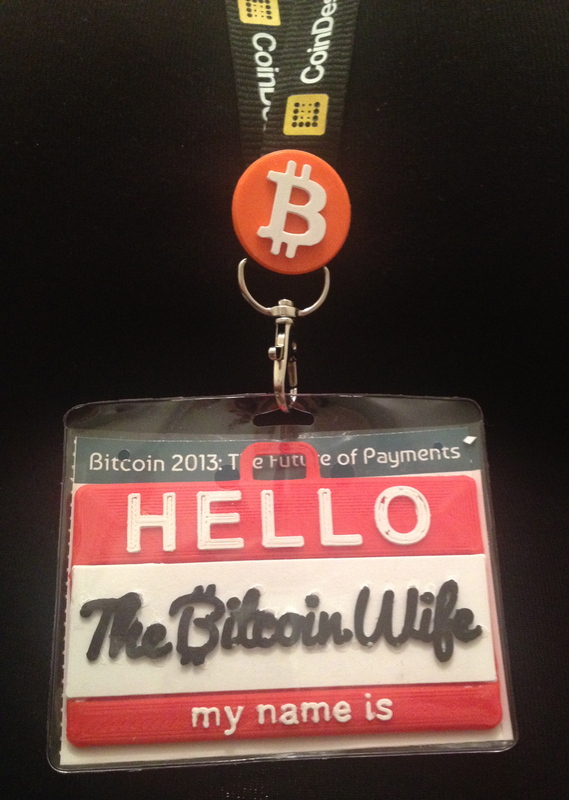 Bitcoin 2013 was our first official weekend getaway without kids. All my fellow lactating sisters who just weaned their babies can feel me on this one. Free of all spawned attachments, it was a slippery slope assuming our drinking habits of days gone by. When did we get so old? When was the last time we stayed up past 10? When did hangovers get sooo debilitating? Free drinks are such a good…bad…good…no really bad idea. Dewd, it was epic. Yep, still recovering. Then there were the WOMEN! Oh em gee, I met some fantastic women at the Conference. We really did only made up 2% of the conference (not including the Neft Booth girls MEOW!) but it was great. I met spunky Ruby from Kraken, with whom I joined forces in a futile attempt to corral all the women together in one place (we’ll get it right next year), Carla from Fr33 State who enlightened me on the communal bonds of liberty and freedom from government, Stephanie from Let’s talk Bitcoin who I can attest as a personal witness – does indeed have THE SEXIEST voice in Bitcoin, Paige from BitPay who has the tenacity to take on LA and bring Bitcoin to Hollywood! There was Maggie, who has had to put up with the AC on full blast 24/7 so her boyfriend could keep his mining rigs nice and cool. And Marcie from BitInstant, who, with her adorable 14-month old in tow, is on a mission to bring more women to the fold. I am inspired and excited by the diverse demographic of females I met at the conference, and have no doubt in my mind that this supposed lack of women in the Bitcoin arena is going to change this year. We are here, and we are ready to take on the world! We decided enough was enough. We set up a Bitcoin Hawaii group on Meetup, and we actually have 7 real people coming. What the what!! Mister P and I are heading out the door as we speak in hopes of finding other locals as jazzed about Bitcoin as we are. Woot woot! What a weekend, what a honeymoon, what a time. And with that, I leave you with this little diddy.